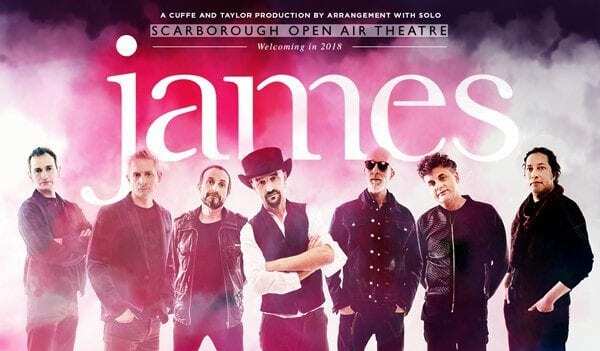 Indie music legends James are to play a headline show at Scarborough Open Air Theatre this summer. The band behind such anthems as Sit Down, Born of Frustration, She’s A Star and Come Home bring their sensational live show to Europe’s largest open-air theatre on Saturday August 18. James’s enduring creativity and musical legacy has made them one of the most influential British indie bands of the last four decades. After signing to Factory Records in 1982, they went on to release a series of massive hit singles and have built a huge, loyal and fanatical fanbase. The band embark on a UK tour in May – visiting many intimate indoor venues – before a series of major festival appearances and huge outdoor dates, including the not-to-be-missed return to Scarborough OAT where they headlined in 2015. This was in the days when a water-filled moat stood between the stage and the audience. The band’s Scarborough OAT show is presented by Cuffe and Taylor. Director Peter Taylor said: “James are rightly regarded as one of the most important and influential pioneers of the Manchester music scene since the 1980s. James join a fantastic line-up at Scarborough OAT this summer which includes Britney Spears, Noel Gallagher’s High Flying Birds, Emeli Sandé, Lionel Richie, Pete Tong and the Heritage Orchestra’s Ibiza Classics, James Arthur, Texas, Nile Rodgers and CHIC, Bastille, Il Divo, Gary Barlow, The Script, Steps and Alfie Boe’s special Armed Force Day concert. Tickets for James’s gig go on general sale at 9am on Friday March 30 from www.scarboroughopenairtheatre.com or from Scarborough Open Air Theatre Box Office (01723 818111) and the Discover Yorkshire Coast Tourism Bureau (01723 383636).